I prepared a report about Winchester rifle brass calibers and their avalability. This can range from currently in hands of suppliers ready to ship if my supplies run low, they are listed as“available”. Available usually means always available so generally I do not break the bank on these and filling large orders is retaliative easy task. Examples are 30-06 Springfield, 270 Winchester, 30-30, 223 Remington and all the rest what the industry considers common calibers. “On hand, limited quantities” refers to stock on hand and once sold out may be a while before I can restock. Winchester appears to make periodic production runs that may take three to six months to fill. “Old stock on hand”, this is calibers I managed to find, quantities are limited to supplies on hand and in all likely hood there will be no replacements because this is packaged in vintage Winchester-Western 20 piece boxes and are twenty years or longer when last made so there is not large amounts around to find. Finding them in virgin brass is even rarer. 25-20 W.C.F., 30-40 Krag, 32-40 Winchester, 348 Winchester, 358 Winchester, 35 Remington and 375 Winchester may never be seen again, not a absolute, just not probable. They are cataloged still but have not been on dealers shelves in a very long time. Who knows, there may be a surprise in store in 2018. 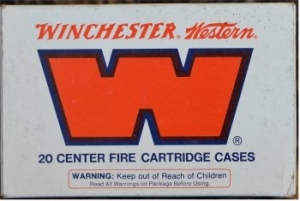 30 Remington, 32 Remington, 300 H&H Magnum and the 375 H&H Magnum are no longer listed in Winchester’s catalog so other than some of the mentioned calibers I have on hand there will be no new replacements from Winchester. The 375 H&H is currently produced by Remington seasonally, the 358 Winchester is made by Starline and Hornady offers the 300 H&H. The only source of 25-20 Winchester is to resize the 32-20. Starline suggest doing so on their web and currently I am not aware of ANY manufacture (small or large) producing any. Quality Cartridge catalogs the other calibers mentioned on a seasonal base, which can stretch to a batch year.